Ron Asheton, cofounder of THE STOOGES, NEW ORDER (with Dennis Thompson), and DESTROY ALL MONSTERS died over the weekend of a heart attack. Ron was a gifted songwriter and highly influential guitarist who inspired tens of thousands of musicians over nearly 40 years. He was as humble and modest as he was brilliant. He is greatly missed by all who knew him. Teenage Head lead singer Frankie Venom died Wednesday, October 15 of throat cancer at the age of 51. Frankie, born Frank Kerr in Glasgow, Scotland, formed Teenage Head with guitarist Gordon Lewis in 1975. Their major influences were the NY Dolls, The Stooges, and The Flamin' Groovies. whose song "Teenage Head" was the source for their band name. TH moved to Toronto in 1977 and became Canada's number one punk rock group, selling thousands of albums, hit singles, and earning gold and platinum records in Canada and Europe. A crippling car accident in 1980 sidelined guitarist Gordon Lewis at the peak of their success and stalled a launch into the U.S. market, where they enjoyed cult status but not the commercial success they achieved elsewhere. Teenage Head headlined Bookie's several times as well as the Kramer Theater and other major Detroit venues. Their music was a unique blend of punk, rockabilly, heavy metal, and New Wave pop, defined by Frank's gritty yet melodic vocals and Gordon's memorable guitar hooks. 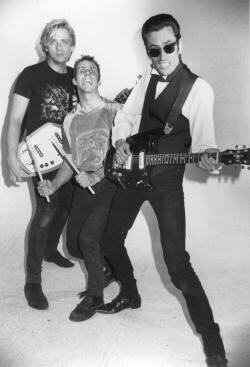 They were huge and lasting influence on the Detroit punk scene as well as thousands of Canadian rockers. The 30th annual Anniversary will be held over three nights - Friday, March 14th at the Ritz in Warren; Saturday, March 15th at The New Way in Ferndale; and Sunday, March 16th at Dylan's in Grosse Pointe Park. More information coming soon! This year's Bookie's Anniversary Reunion was held at Paycheck's in Hamtramck on Friday, March 17 at 9 PM. Featured were The Sillies, Scott Campbell, Regal, Toasters Not Torpedoes, and special guests from Flirt, Cadillac Kidz, the Roommates, and more. This year's Bookie's Anniversary Reunion will be held at Small's in Hamtramck on Saturday, March 20 at 10 PM. The lounge at Small's has a nostalgic elegance reminiscent of the original Bookie's long before it became a parking lot. Live sets by The Earworms (ex-Reruns), The Sillies and 3-D Invisibles, and Sloop Jon Spaceranger, plus special guests from Bookie's-era bands will provide much but not all of the live entertainment. Admission is only $5 and is 21 & over with convincing ID required. This only happens once a year, so don't miss out on the fun! For more details, listen to WRIF 101 FM 10 PM Sunday, March 14 and watch this website and thesillies.com for further updates. Detroit rock guitarist Craig Peters succumbed to heart disease on November 27, 2003. He was 45 years old. Craig went on to play lead guitar for The 27 and Pack 9, house band for New York City's legendary Peppermint Lounge. 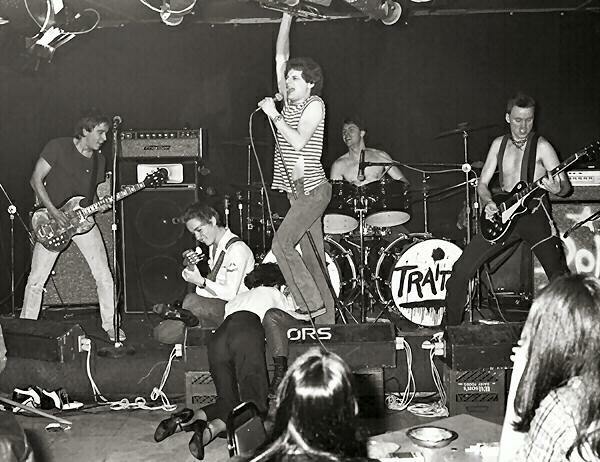 The photo at right shows Craig at the far left with The Traitors; Don Was on vocals. Click on the picture for a larger view. The Sillies show at Alvin's on Friday November 14 will also include performances by Bump-N-Uglies,The Smarties, and a 9 pm showing of the film "History Of Detroit Rock" on a 20 foot screen. The film incorporates highlights of the 1979 punk documentary "Face The 80's" shot at Bookie's Club 870 and Ann Arbor's Second Chance plus the 1992 MC5 reunion and the final show by Mitch Ryder & The Detroit Wheels, including Mitch, guitarists Jim McCarty and Robert Gillespie, drummer Johnny "Bee" Badanjek, and Scott Campbell on organ and piano. A bar opened recently in downtown Detroit called "Bookie's Tavern". Its owner/managers have no connection to the original Bookie's. I have been told it is a "fern bar", appealing to yuppies and based on a 1930's "gangster" theme. Why it wasn't called "Gangster's" or "Capone's" or any of a number of names that conjure up the image of '30's gangsters is beyond me. I quit a good paying job at Chrysler to start Bookie's and made more in one day at my old job than I made on a good week at Bookie's. I booked the bands, designed the flyers and monthly calendars, put up my own hard-earned money to pay guarantees to bring in national acts like The Police, bought, assembled, and operated the p.a., and did everything except sit around during the day drinking with the bar owner in order to keep him happy with what we were doing. After nearly two years, I was asked by my business partner to leave so he could use the bar as a springboard for starting a major concert promotion company. The reason we started Bookie's in the first place was to have somewhere The Sillies and like-minded bands could play our own music instead of five sets of Top 40 radio material. I was assured we could come back and play the room we started anytime we wanted, though that later turned out to be untrue. Shortly thereafter, I started Todd's and turned it into what Bookie's had been originally. We have received a number of letters here at the website from former Bookie's patrons who are angry that a bar is using the Bookie's name. They feel the new place is a complete betrayal of what Bookie's came to mean to the people who made it what it was. We have discussed the possibility of starting a new Bookie's, based on the principals of the original. We would like to know your feelings on this. The new place would be part bar and part museum, but it would be dedicated to making a place for musicians to play their own music to the type of people who can appreciate something different, unique, and honest. Please let us know what you think. Our e-mail address is:	DetroitRockScene@aol.com. We'd like to thank all the people who have emailed us with their memories, photos and flyers for the site. The overwhelming response we've gotten since the site first went up has been really gratifying. We'll be updating with this new content very soon; as always, if you have anything you'd like to contribute, please let us know..